What do marketing orgs look like in the martech age? Let’s find out. I know, you get asked to participate in a ton of surveys. You’re super busy, and most of the time, the results of these studies are of dubious value to your actual work. So it’s easy to pass on taking them. 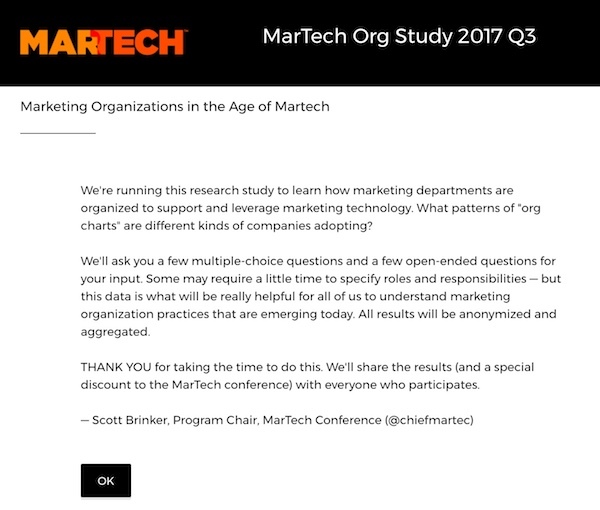 But if you like the content of my blog, and have ever found it helpful, I’d personally ask you to participate in this survey: Marketing Organizations in the Age of Martech. I also believe that the results of this one may be quite valuable to you. The thesis of this study is that marketing technology is reshaping the organization of the marketing department. Directly, marketing technology and marketing operations have become prominent roles, with expanding teams of their own. But indirectly, martech also changes the way the rest of marketing is able to function. Marketing can — if it develops the necessary organizational capital — orchestrate across channels, adapt to feedback in rapid fashion, leverage data from a myriad of sources, run experiments, trial new innovations, and more. In this new environment, is marketing best served by organizing around activities, channels, products, customer segments, or stages of the buyer’s journey? Or some other structure? What capabilities does it centralize? Having talked to many CMOs over the past few months, I’ve come to believe that there are some powerful new options for organizing modern marketing teams. I’d love for us as a community to get greater visibility into what those possibilities look like across a variety of real-world marketing departments. What roles report to your CMO (or highest-level marketing executive)? Who is in charge of marketing technology management and what roles report to them? Who is in charge of marketing operations — if that’s a separate role from marketing technology — and what roles report to them? You don’t have to identify yourself or your company to participate. And all data will be aggregated and anonymized before it is published. But we will share the results at the end with everyone in the community — no paywall or high-priced report at the end. We’ll do some nice visualizations to reveal the different org patterns that we discover. As an extra little “thank you,” we will also provide everyone who completes the survey with a discount code* for the upcoming MarTech conference in Boston, October 2-4. Take 10 minutes to contribute to this survey now. Thank you! P.S. The marketing org chart shown at the top of this post is an amalgamation of several of the common structures that I’ve seen recently. But this Marketing Organizations in the Age of Martech study will give us a lot more real-world data the different structures being used. Please participate — thank you! 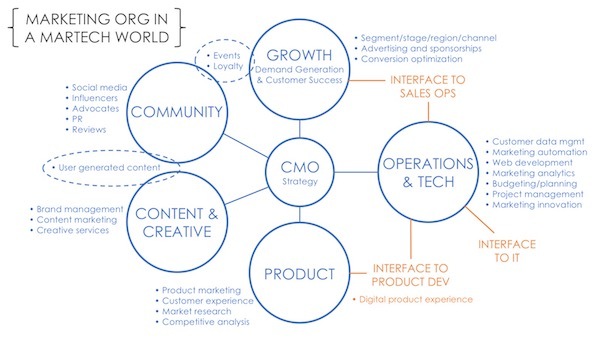 The post “What do marketing orgs look like in the martech age? Let’s find out” appeared first on Chief Marketing Technologist. *Code cannot be applied to registered MarTech East 2017 attendees and cannot be combined with other offers.